Love it when the whole family rides the bus. 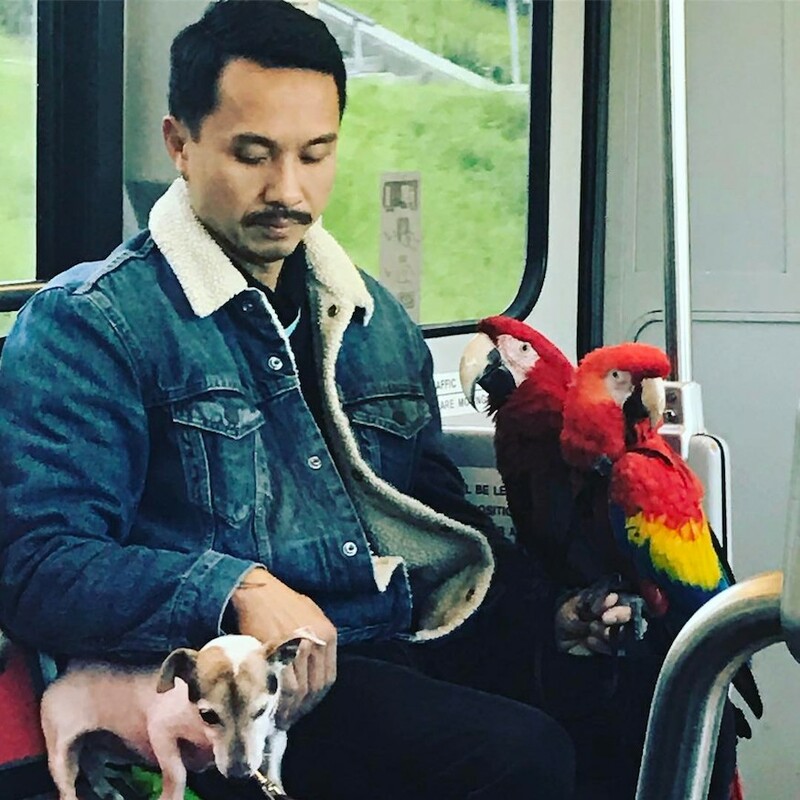 Tiny dog looks a little scared but the parrots are giving zero fucks. Thanks @peepholier on Instagram for this pick-me-upper. We have more cute animal photos on Muni to help you get over hump day. 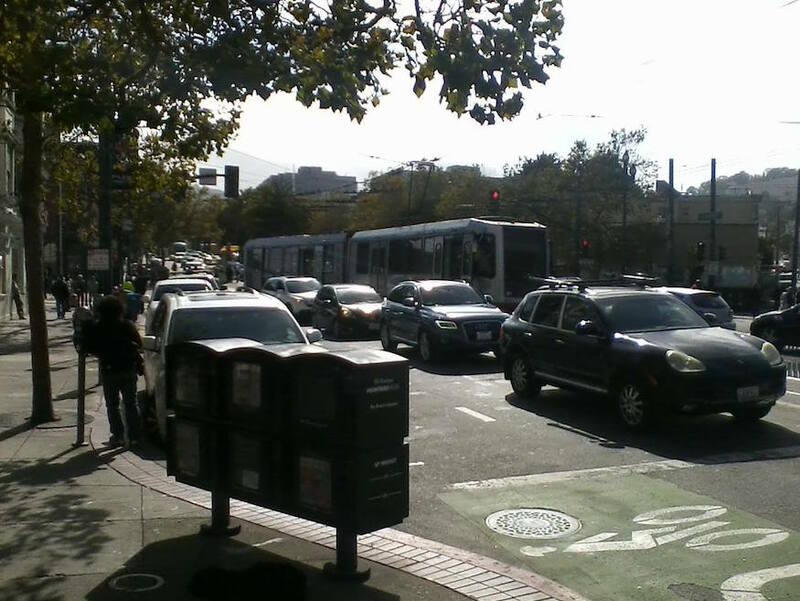 Hey Muni Diaries, my brother sent me this photo of a J-Church Breda car that accidentally turned right onto Market yesterday. 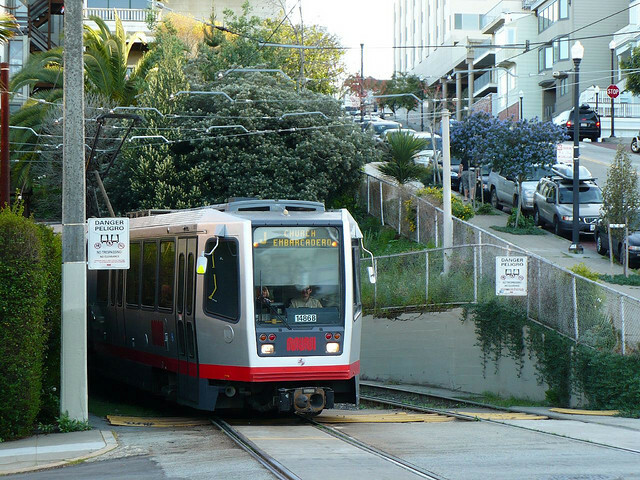 It makes you wonder—after the new trains come, will the Bredas be historical F-line material? Today becomes tomorrow’s yesterday. Or something. Here’s a photo that makes you wish that you were young again, at that age when you didn’t care about the number of reasons why riding the outside of the J could be kind of dangerous, and you never worried about knee problems because you are going to live forever. 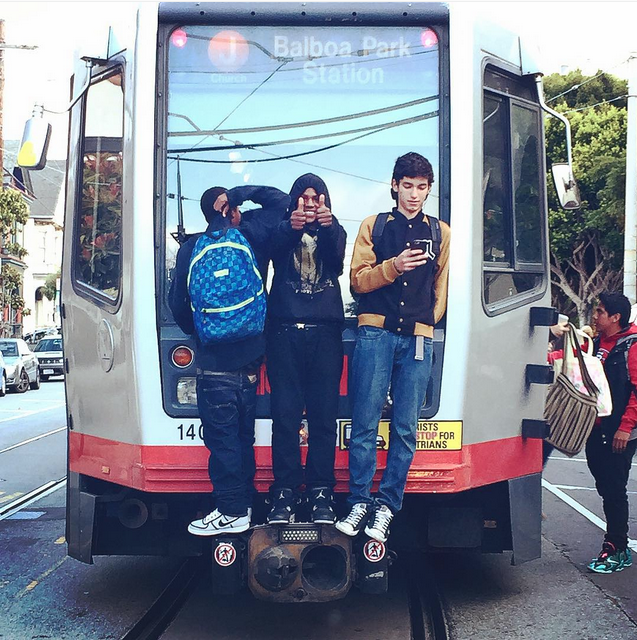 Thank you to Robert of Robert Leidner Photography for this great photo we’ll add to the collection of wholly unrecommended ways to ride Muni. I mean, I know it’s been hot and muggy lately. But I ask you in all sincerity precisely W in the actual F is happening here? I wonder who the No. 1 most commonly mistaken celebrity in the world is. Just yesterday at lunch, I was positive that The Jinx‘s Robert Durst was a few seats down from me at the bar. No, it wasn’t him. And yes, I finished my lunch. Muni rider and friend of Muni Diaries Stephanie sent us the photo above. 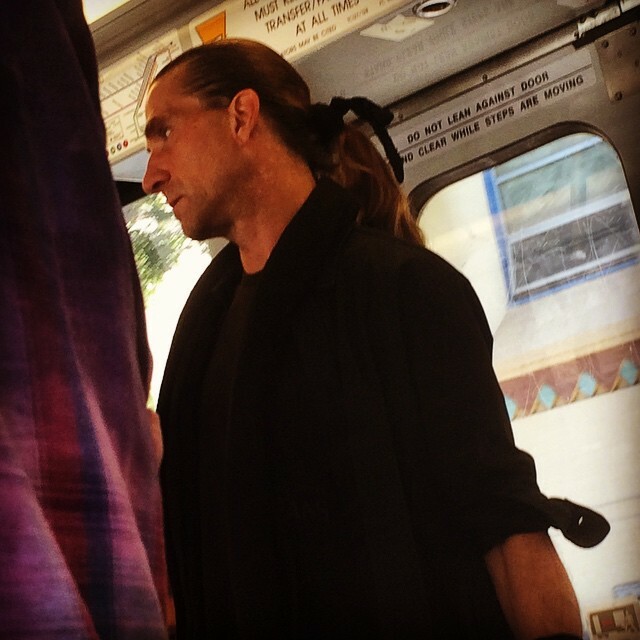 Methinks this is actually Fabio himself, not a doppelganger. And I am right about this. I’m so sorry. My 4-year old son projectile vomited on some of you at about 8:30 on February 3. We were inbound into Van Ness station, me standing, him on my left arm. No, I don’t normally hold 40-lb people but, as you heard, he was whining so I picked him up to comfort him and also to make your ride less unpleasant. You’re welcome. But I guess whining “I’m not going to make it” didn’t mean what I thought it meant. The doors were seconds away from opening when he coughed. Well…it seemed like a cough. But there was stealth vomit behind the cough. The brunt of it landed on me (glasses, cheek, shirt, jacket, bag). If normal, it would have dribbled onto only me, but being the projectile variety, you folks within 2 feet got sprayed. I’m sorry. I wish I could have apologized more but the doors were open by the time it landed. But I did have a moment to look around to assess the damage. I don’t know what I would have done if we had more time with you, victims of vomit. Offer to pay for dry cleaning? Buy you a drink? My son’s name is Seiji. He is good at making Ninja Turtle masks out of tin foil. Maybe you’d like some? If you see us again, let us know. On behalf of Muni Diaries, Seiji’s dad, we forgive you.